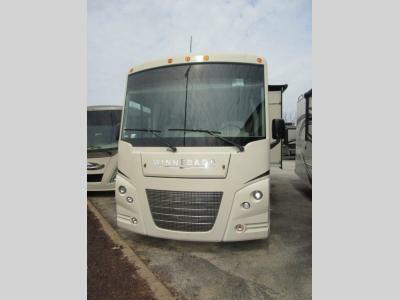 With this line of Winnebago Vista Motorhomes, stepping up to Class A has never been easier because of the legendary standards this brand is built upon combined with its advantageous price point. Whether you are driving along the road in the cab or taking a break from travel to lounge in the coach, this line of motorhomes gives you comfort where you need it most with amenities like the multi-adjustable Primera® cab seats with fixed lumbar support and the foam mattresses in the bedroom. 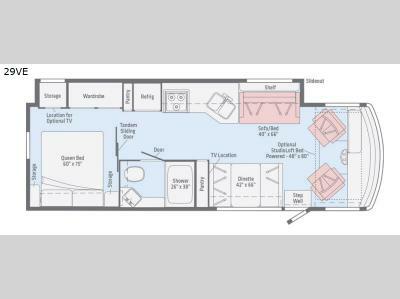 Every space of these Vista Class A Motorhomes is outfitted with the latest modern styles and appliances. The vinyl flooring throughout the coach gives everything a fashionable quality, and the LED lighting keeps everything looking bright and fresh. Even the bedroom has a stylish flare with its decorative bedspread and headboard, and as you prepare your meals each day you will admire the beautiful backsplash and enjoy cooking with the newest 3-burner glass top range and microwave oven. 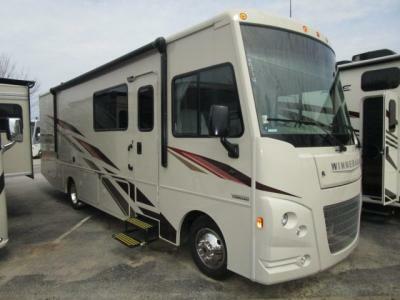 If you haven't yet taken the opportunity to experience the pure quality and affordability of the Winnebago Vista Class A Motorhome, now is the time to do so!